Prototype: Belgian State Railways (SNCB/NMBS) class 25 general-purpose locomotive and three different type M2 commuter cars. The locomotive and cars look as they did at the beginning of the Nineties. 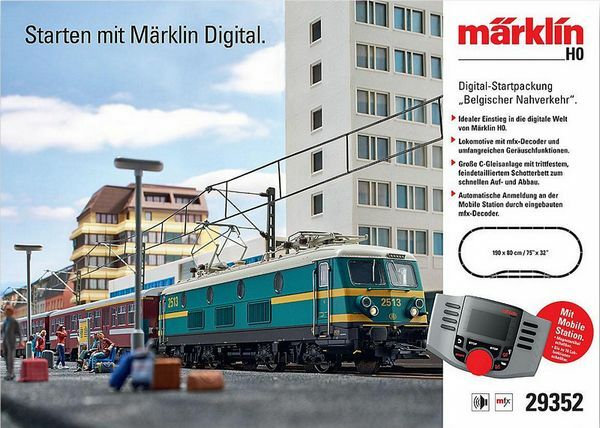 Model: The locomotive has an mfx digital decoder and high-efficiency propulsion. 2 axles powered. Traction tires. The dual headlights and dual red marker lights change over with the direction of travel, will work in conventional operation, and can be controlled digitally. Maintenance-free warm white and red LEDs are used for the lighting. Train length 103.2 cm / 40-5/8". Contents: 14 no. 24130 curved track, 9 no. 24188 straight track, 9 no. 24172 straight track, and 1 pair of no. 24671 and 24672 curved turnouts. Feeder wire set included. A track connector box, a 230 volt / 36 VA switched mode power pack, and a Mobile Station are included. An illustrated instruction manual with many tips and ideas is included. This set can be expanded with the C Track extension sets and with the entire C Track program. Dual headlights and dual red marker lights that change over with the direction of travel. Power supply can be switched to operated from catenary.